There may be no better sign on which to lean a bicycle with 650B tires. Photo by Mitch Hull. I like this bicycle. It doesn’t fit me, I’ve never ridden it and I don’t own it. I like the idea of this bike. First, it’s a randonneur bike. That means when I first saw Mitch Hull’s Boxer Camponneur in 2012 in Arthur, Illinois, it was the first bicycle of its kind I’d seen outside of books and magazines. I’m not sure I’ve seen another since. Because it is what it is, it has everything you need: lights, fenders, a rack for the handlebar bag and lightweight, supple 42-mm tires for paved and unpaved roads. Want to replace all the bicycles in your basement with one machine? Well, of course not. But if you did, you could do worse than a bike like this one. The frame is handmade. In this case, handmade means Dan Boxer, the owner of Boxer Bicycles, was also the constructeur. He built this bicycle for Mitch, for a specific customer. He built a different bicycle before this one and a different bicycle after this one. Handmade is different, and–despite the miracle of social conviviality that is interchangeable parts, production lines and extended supply chains–different is good. 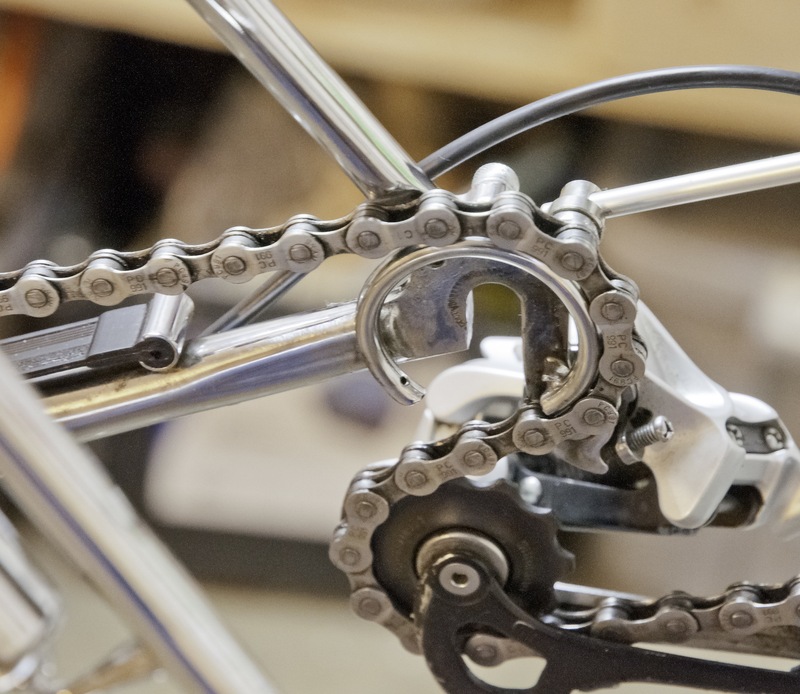 Shift the chain all the way to the outside, and it lands on a chainrest brazed to the dropout. Photo by Mitch Hull. Is it possible to copy a handmade item? Sure, consider Grant Wood’s painting “American Gothic.” There are a lot of copies of Gothic–even more parodies–but they’re copies, and everyone knows it. When you see a copy, you recognize the structure that defines the original. When you see the real thing, you see time rolling backward, into the past, back into the world that summoned up the work. When you look at this Boxer, you’re looking at the real thing, even though this real thing alludes to other real things that emerged from France in the 1940s and 1950s. You might not see time rolling backward yet, but you will in a few more years. For one thing, Boxer Bicycles has apparently closed. Its website has disappeared, though Dan’s Flickr account is still up. Jack Trumbull of Franklin Frames put in long hours to prepare the Boxer for chroming. He also attached the Compass tail light. Photo by Mitch Hull. Does that make this an increasingly rare bicycle? Maybe. But no one who creates handmade bicycles is turning them out in the millions. They’re all rare. Don’t get me wrong: You want production companies turning out bicycles in the millions. More bikes is a good thing. But if you like small business, if you like focus, if you like different, you should like handmade bicycles. Why? Maybe it’s the style. Maybe its the craftsmanship. Or maybe it’s all the chrome that’s been added since I saw it last. 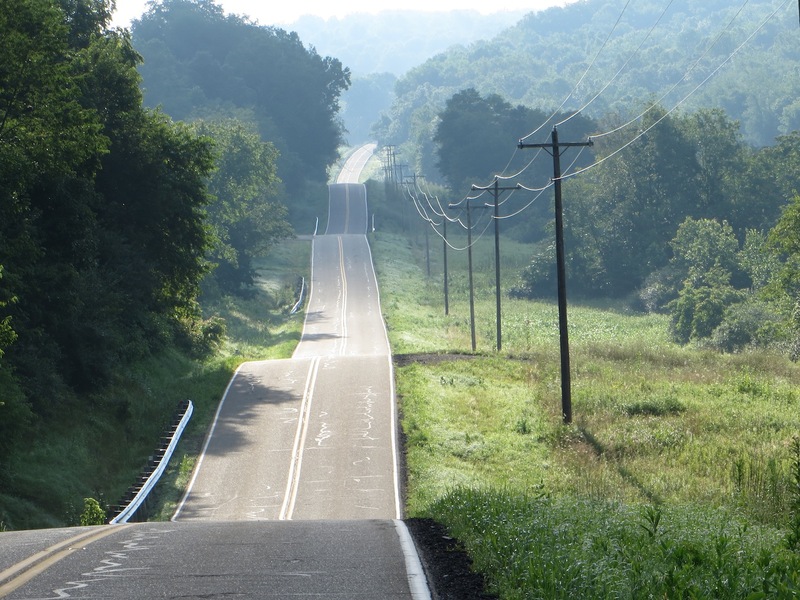 The Boxer was built for Mitch and the roads of Ohio. Photo by Mitch Hull. 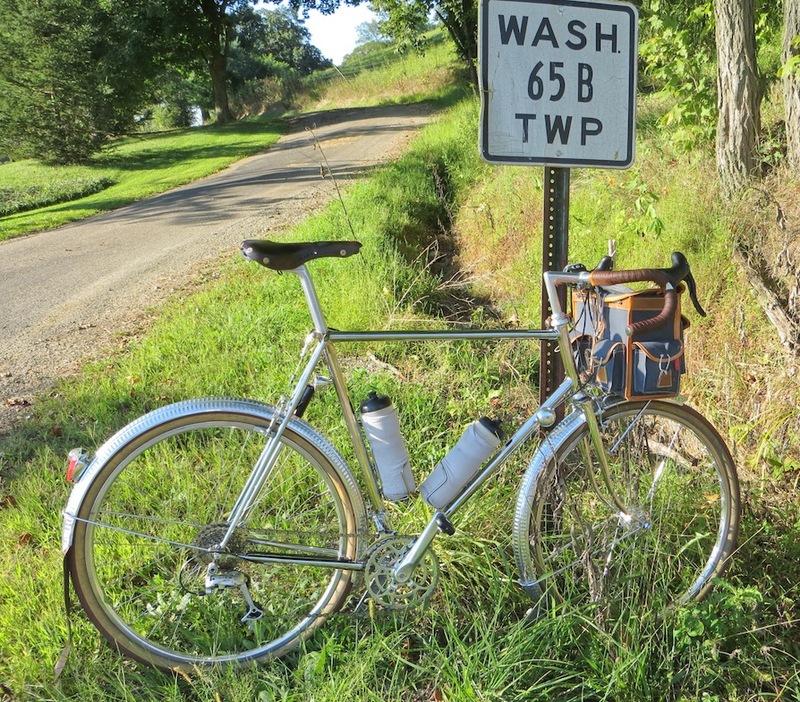 This entry was posted in Other bicycles and tagged Boxer Camponneur, chrome, handbuilt, handmade, Mitch Hull, randonneur. Bookmark the permalink. These are my favorite kind of bikes – rather than being a special purpose “one-trick-pony,” you can quite literally do just about anything on this kind of bike. Plus, it’s custom fit to one’s own torso and geometry. Plus, it’s all chrome so there’s much less worry about paint. I’ve got two more articles to come on this bike. One discusses changes made to it since 2012, in addition to the chrome, and the other is an interview with Jack Trumbull, who told me about prepping the frame for chrome. He said he polishes the bike until it looks like chrome, before it goes out, because every imperfection will reveal its appearance under the chrome. Prep takes hours. BUT, it’s all CHROME when it comes back. Thanks very much for these articles. When I first got the Boxer, I showed it to the 8 year old kid next door. I asked him if he’d ever seen a bike like it before. Thank you, Mitch. Really enjoyed the back and forth. All I need now is the museum’s hours. I thought I was the only one left who liked chrome bicycles. Everyone looks at me weird when I tell them. Thanks for sharing this beauty. I have a chrome Bianchi Pista, and I like it, but I like the Boxer even more because it was chromed in the United States. It’s good to know that someone here still has the manufacturing competency to do the job right. 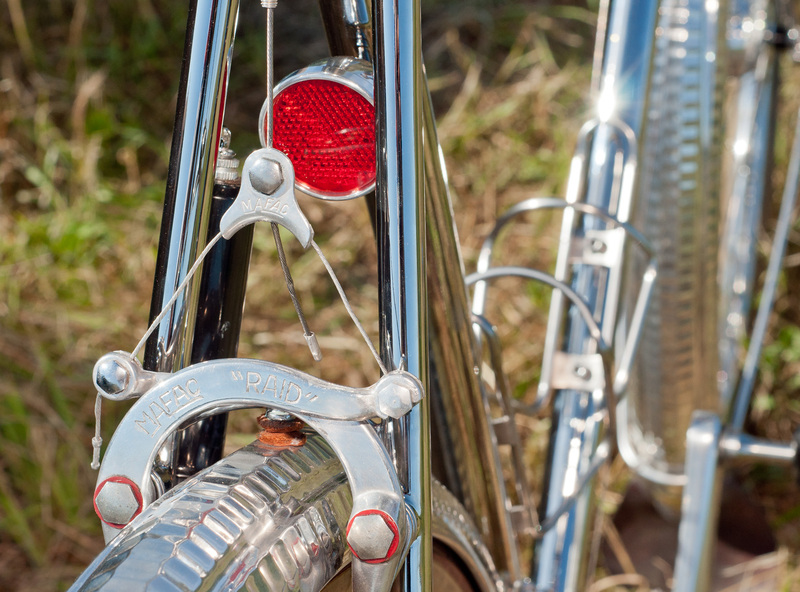 Chroming a lightweight bicycle frame requires such a greater degree of quality control than a car bumper. the owner of the bike shop I used to work for has a chromed Franklin Frames tandem. beautiful bike, beautiful work. I don’t think I’ve ever seen a chrome tandem. But, to judge by my conversation with Jack Trumbull, it would have to be gorgeous. If you’re ever in Gahanna, OH, the bike shop is Bicycle One. Hopefully it’s still hanging up, I haven’t been there in a year.